The concept of “based upon Book X by Author Y” is stretched pretty far these days. Sure, sometimes you get a Harry Potter or a Twilight, but other times you get a movie or TV show that is so loosely-based on the source material that, if the book was a person and the TV show was a pair of jeans, the combination of the two would violate the saggy-pants bans that are in effect in several states. I mention this because I watch the TV show Haven. In the opening credits and most of the promotional material for season one, the producers hit “based on The Colorado Kid by Stephen King” pretty hard. When I first saw the promos, I figured, okay, this should be somewhat interesting. And it is; I happen to enjoy Haven, even if I’m still concerned they won’t be able to wrap up everything from this season in the upcoming finale*. They take place in Maine. They both have small-town newspapermen Vince and Dave. There’s a bar/restaurant called The Grey Gull. The policeman’s last name is Wuornos. So, saying Haven is based upon The Colorado Kid is, in my opinion, a little disingenuous. 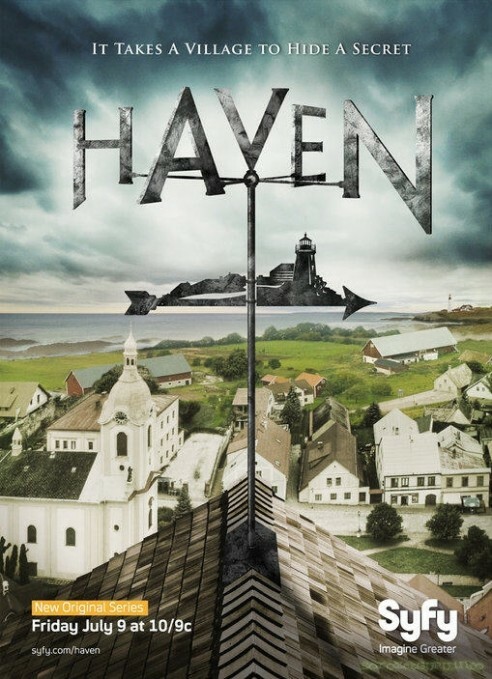 Especially since Haven is quite clearly a genre show, while The Colorado Kid is a straight-up mystery novella. The Colorado Kid is mostly a story-within-a-story. The main character, Stephanie, is a journalism student working an internship in Moose-Lookit (a small island in Maine, at least an hour away from Bangor), at the local paper — a weekly run by Dave Bowie and Vince Teague. After a few months on the island — which is so small that it and so inaccessible that older students need to take the ferry to get to and from high school every day — Stephanie has been accepted by the town and by her bosses. In other words, she’s no longer an outsider. One day toward the end of her internship, Stephanie, Vince, and Dave host a reporter from the Boston Globe who’s writing a series of features on unexplained mysteries of New England. After he’s gone, Stephanie learns that Moose-Lookit does indeed have an unexplained mystery, but it’s not the kind of thing Vince and Dave feel comfortable telling the Globe about. 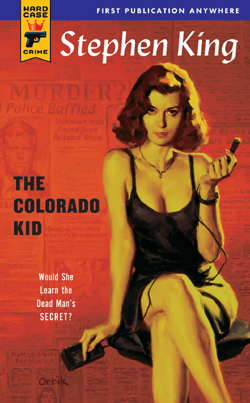 Instead, they tell Stephanie the entire story, and that’s the main plot of The Colorado Kid: who was the man found dead on the beach, who killed him, and why? Throughout the whole book, I kept waiting for the King twist — what was the supernatural aspect going to be? What kind of monster would end up being the killer? And, because Haven was ostensibly based on the book, when was I going to read about “the troubles”? Answers: it wasn’t a monster, and never. Because The Colorado Kid is a straight-up mystery. I’m not going to say I was disappointed with the story, because I really wasn’t (although the ending was a bit of a head-scratcher). I think the issue was more that I went into it expecting one thing and I got something totally different. I was primed for a supernatural story — I’ve read several of King’s other stories, novellas, and novels, and it’s pretty well-known that he writes mostly genre fiction — and the fact that Haven was based on the book (or so I’d been repeatedly told by the show’s promotional material) made me more-or-less ready for one. In the end, I’ll say this: if you like Stephen King’s style of writing, you’ll probably like this book. If you like mysteries, you might like this book, although you’ll probably do some head-scratching, just like I did. But if you go into it expecting a sci-fi, fantasy, or horror story, or a story anything like the television show Haven, The Colorado Kid will probably disappoint you. It’s a pretty good story, but it’s not a genre story. Note to Parents: The book contains some gross-out scenes, especially during the autopsy, but is otherwise acceptable for most teenage audiences. They’ll probably think it’s boring, but there’s nothing objectionable. Of course, you should use your own discretion when it comes to your children. * I wrote this before the season finale. It did… pretty well, actually. A friend pointed out to me on Twitter just the other day that as of this week, it is exactly one year since I picked up my first Stephen King book and started reading. 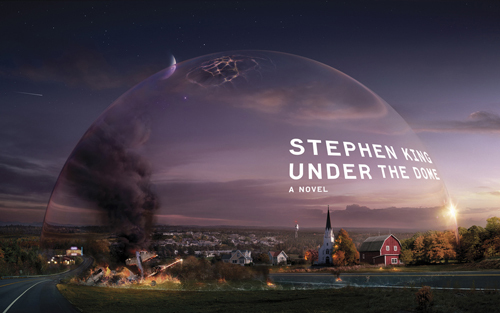 That book was Under the Dome, which came out in November 2009, and I was utterly enthralled from beginning to end. As soon as I had finished I set myself the task of reading all of his work, in publication order. A year later and I have only reached The Stand – hey, it was a busy year – but I’m still loving every single word. 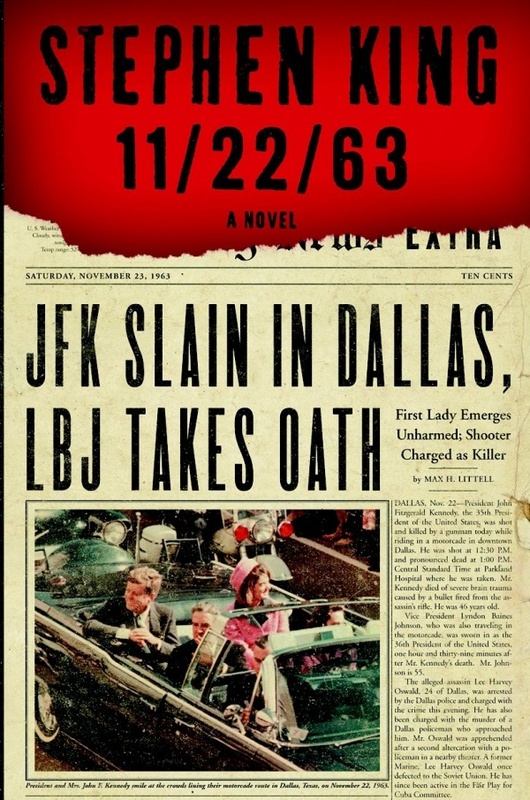 As a genre reader and writer, it might sound surprising that I came so late to King’s work. While his career has had high points and low, he is generally considered a master of science fiction, horror, and just plain writing, ably treading the line between vast commercial success and quality content. But the reason I only came to his gigantic body of work with his latest novel is that prior to this, I was a King snob. Commercial success on such a scale usually meant – so I thought – very poor writing. This is often the case, but it was that foray Under the Dome last November that taught me a very good lesson indeed, one that is second only to the pants* rule. It’s slightly oblique but I’ll try to explain. That lesson was: everything is about ‘the story’. Okay? Hold tight. Here we go. Currently we are continually bombarded with bad news about the publishing industry – about how publishing is on a downward slide, book sales are floundering while editors at the big houses flap to catch the next big trend or play it safe with unadventurous, unoriginal content. The industry is being shaken up by digital publishing and ebooks, while opportunities for new writers trying to get a break are shrinking more and more. It would be easy, with all of this, to take a very bleak view, and certainly I’m not suggesting that the bad news is not true. If you were of a pessimistic nature you could lament the death of books and of writing as you sob into your cocoa in front of the TV. But there is one thing to remember amid this doom and gloom. Writing and “the story”, to use some quasi-mystical catch-all, is all around us. Take a look at what you do during the day – strip out the day job (unless you actually make a living writing), the chores, the laundry, brushing your teeth, and look at what you do for entertainment, and what entertains you. I’m willing to bet that most of it, maybe 90%, is “the story”. And “the story” means writing. There are more TV shows and films now than ever, and certainly in recent years a stonkingly good selection of exceptionally high-quality ones. It’s all “the story” – fiction, written by writers. And everything that surrounds it – special effects, marketing and merchandising, even the actors, producers, directors, crew, etc – are all there to deliver “the story” to us. The world of books is just one tiny facet – there are comics, television programmes, films, and games (video or otherwise). It’s all writing. It’s all “the story”. Two things really crystalized this for me. Firstly, a couple of years ago I went to a comic convention which featured a host of writers and artists from DC Comics, including their commander-in-chief, Dan DiDio. During a weekend of panels and discussions, one thing became very clear. The DC universe is one giant story, a tale so big and sprawling that it literally covers the walls of several offices in New York. The job of DC is to deliver this to us, and to continue its development before passing the baton to the next batch of creators and producers. The same can be said of Marvel, or Image, or 2000AD, or any comic publisher or endeavour. The scale of it was quite frankly mind-blowing, and I came away from that con with my first suspicions about “the story” and how it impacted practically everything I did and was interested in and did. The second moment of realisation came earlier this week, when I was fortunate enough to attend a small gathering of Doctor Who fans who were hosting an informal interview and Q&A with Daphne Ashbrook, co-star of the 1996 US/UK TV movie with Paul McGann, currently visiting the UK. I’m a Doctor Who fan, I’m happy to admit, but I’ve always had difficulty with the TV Movie. This ‘difficulty’ has evolved from outright denial and upset (hey, I was a sensitive teenager in 1996) through to grudging acceptance of the production, so long as I didn’t actually have to watch it. So driving for an hour to see a co-star I wasn’t particularly interested in talk about a production I didn’t particularly care for seemed, beforehand at least, a bit of a chore. But, what the hell. When was this opportunity going to come up again. Of course, it was a marvellous evening. Daphne was a delight, and kept us entertained for close to two hours on the ins and outs of her impressive career (come on, forget Doctor Who, she was in Knight Rider, The A-Team, and Star Trek: Deep Space Nine; hell, even Murder, She Wrote). It was a revelation, especially when I realised that large parts of her lively discussion were her relaying to us the plot of these various shows, so we could have a better understanding of the role she played in each. There it was. “The Story”. As an experienced actor, Daphne’s job is to deliver “the story” to us. And “the story” means writing, plain and simple. Storytelling. Writing. Same thing. So what’s the magic advice I distilled from all of this? Give up on the novel and try a screenplay? Not at all. My advice is to realise that “the story” is everywhere, and like the guys from Pixar keep saying, “the story is king”. With this in mind, and knowing that writing is a never-ending quest to get better, it’s our job as writers to absorb as much of “the story” as we can. This means reading outside of our comfort zones and genres as well as within them – if I didn’t decide to try Stephen King I would never have discovered his extensive, and quite wonderful, back catalogue. 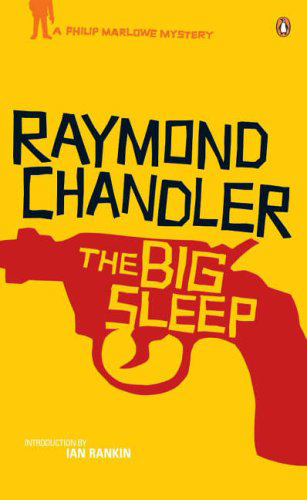 When I was prepping to write a detective noir novel, I decided to bite the bullet and read The Big Sleep by Raymond Chandler. Whammo, the whole world of pulp detective fiction was opened to me. One often-quoted piece of writing advice is to not just turn off your television, but to get rid of it entirely. Stephen King himself goes off on this in On Writing. A lot of writers follow this advice to the letter and do very well indeed. But personally I think this is missing the point, because between the inane loops of twenty-four hour news, reality shows and quizzes, the blowhards that King describes so well in his memoir of the craft, there is some damn good stuff on, be it a television series (old or new) or a film (old or new). So if “the story” is about writing, then by picking and choosing carefully and by not letting it become a time-sink (and that really is where the danger lies and the advice stems from, I think), you can watch, enjoy, and learn from some very, very good examples of the craft. “The story” is everywhere, and where the story is, you’ll find writing. That will never, ever go away, no matter what weekly slice of negativity comes from the traditional publishing industry. The world needs writers and always will, because our whole lives are based around storytelling. Read books. Watch TV. Go to the movies. But importantly, read something you might not have thought you’d like, and watch a film that isn’t quite the genre you are interested in. At worst, you’ll absorb another little slice of “the story” that you wouldn’t have otherwise and you’ll learn something from it. At best, you’ll discover something new and wonderful and whole news worlds will instantly become available. And then think about it, and learn from it, and write. * The pants rule is pretty simple and surprisingly effective: when writing comes up on your schedule, make sure you are up and doing and dressed. Don’t write in your pyjamas, don’t write in your slippers, no matter how appealing or comfortable it may sound. By “pants”, I mean trousers (not, as British people use it, as underpants… stop sniggering at the back there! ), but that’s just a metaphor for being prepared and ready to write. The more prepped you are – showered, shaved, dressed, in a nice pair of shoes – the better your writing. If you want writing to be your job then act like it. Put on a nice shirt, or skirt, not just your comfy “at home” clothes. You can put those on when you’ve finished your job. In fact, the more formal you make it, the better you tend to feel (although I can’t imagine what happens to your writing if you turn up at your desk in full evening wear or a ball gown… I must give that a go sometime). Try it. It works!